On October 10, 1882, a patent for a simple adding device (US patent 263904) was granted to Christian W. Hergenroeder of Baltimore (see the image below). 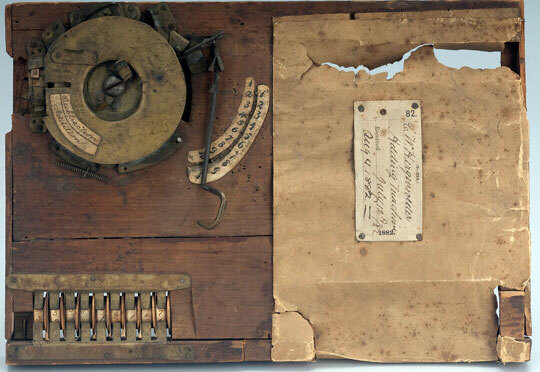 The patent model of the device survived to our time and is kept now in the collection of National Museum of American History in Washington, D.C. (see the image below). The adder of Hergenroeder has a wooden frame with a round brass top and mechanism, with overall measurements: 5 cm x 31 cm x 21.3 cm. A ratchet disc under the top has the digits from 0 to 99 indicated on it. The 99 complement also is indicated (for use in subtraction). To the right of the disc is a series of pins labeled from 1 to 10. An arm extending from the right side of the disc fits between the pins. Pulling the arm forward advances the disc by the amount indicated on the scale. When the disc has advanced a full rotation (the sum of the numbers to be added exceeds 100), it advances a smaller, vertically mounted disc on the left side by one unit, for hundreds carrying. Complementary units are also indicated on the edge of this disc. For convenience in keeping the numbers to be added or subtracted by the operator, is provided a series of nine wooden digit wheels (rollers) having numbers thereon, which rollers are arranged in a recess in the base and partially concealed by overlapping flanges. These are intended for keeping track of numbers used in calculations. The information for Christian William Hergenroeder is very scarce. He was born as Christian Wilhelm Hergenröder in Germany in 1863 and emigrated to USA in early 1880s. His wife, Sofia Hergenroeder, was born August of 1866, also in Germany, and came to the United States in 1891. Their son, Christian Jr., was born in November, 1895. 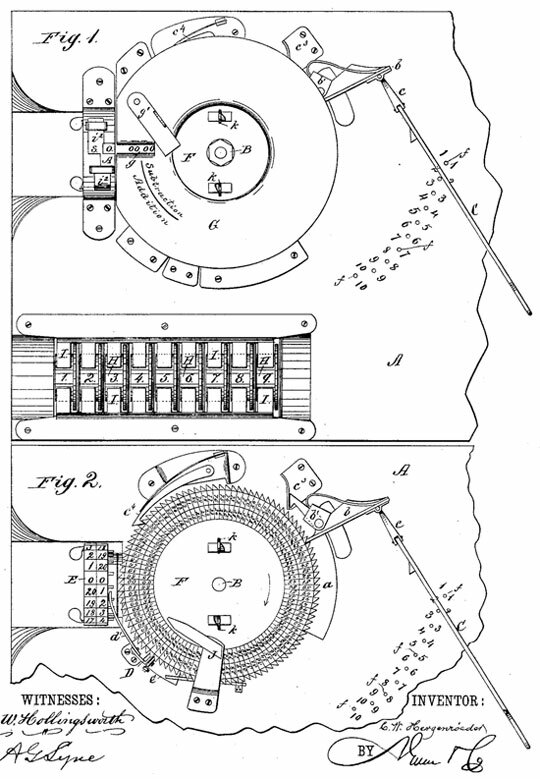 Another patent was granted to Hergenroeder, for an improvement in music leaf turners (US patent 265602, 1882). He worked as a laborer and clerk and died on 23 Oct. 1906 in Baltimore.